12 For thus said Hashem: I will extend to her Prosperity like a stream, The wealth of nations Like a wadi in flood; And you shall drink of it. You shall be carried on shoulders And dandled upon knees. The Ayun River in the Galilee. Photo by Yehoshua Halevi. 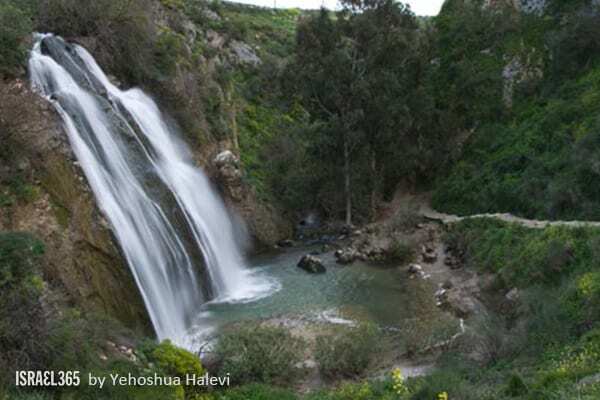 In this final chapter of Yeshayahu, the prophet assures the Jewish people that Hashem will extend shalom (שלום) upon them, and that all the nations will come forth with blessings like a torrent or river sweeping effortlessly along. The Hebrew word shalom is usually understood to mean ‘peace,’ but it is translated here as ‘prosperity.’ Jewish tradition (Mishna Uktzin) teaches that peace is like a vessel that holds all of the other precious blessings in our lives. The blessing of peace is the ultimate blessing, since all the other blessings of the world are contained within it. "Thus YHWH has said: The heavens are my throne and the earth is my footstool. Where, then, is the house that you may build for me, and where the place as a resting-place for me? For my own hand has made ​​all these things, so that all these came to be, YHWH is saying. On this one, then, I shall look, on the one afflicted and contrite in spirit, and who trembles at my word. Whoever slaughters an ox is as one striking down a man. Whoever sacrifices a sheep is as one breaking a dog's neck. He that offers a meal offering – the blood of a pig! The one presenting a memorial offering of frankincense, is as one blessing an idol. They are also the ones that have chosen their own ways, and their very soul delights in their abominations. I myself, in turn, shall choose ways of ill-treating them; that what they fear I shall bring upon them, because when I called no one answered; when I spoke no one listened. They kept on doing what was evil in my eyes, and the things in which I took no delight they chose. Hear the word of YHWH, you who are trembling at his word! Your own brothers who are hating you, that are excluding you by reason of my name, have said ‘May YHWH be glorified!’ He will also appear with rejoicing on your part, and they are the ones that will be put to shame. " The prophecy reveals that truly a Third Temple will appear on Israel’s religious scene, however not initiated by YHWH Elohim, but rather on the basis of a covenant that the Pseudomasjiach of the End times will conclude with the Jews (Dan 9:27). Nevertheless, it is very revealing how Elohim Himself polemizes against the sacrificial cult which then will be revived: He needs no house of those apostates. On the contrary, the time for the introduction of New heavens and a New earth has then just arrived and YHWH Elohim has his own Temple City, the New Jerusalem. However, in the midst of the apostates will again (and final) appear a godly Remnant, faithfull Jews who, in their distressful position, look up at YHWH their Elohim – in the Book of Isaiah often named ‘the Holy One of Israel’ – and heed his Word. These people, he promises to favor. The sacrifices of the apostates will be disgusting in Elohim's sight, since it is clear that they thereby knowingly reject the one and only superior sacrifice of his own Son. Since they again reject his leadership and instead look up at demons, they run the risk that YHWH Elohim will allow them no further repentance. Nobody needs to ask from which 'corner' the hateful attitude will arise. Of course, it concerns that old blind hatred with regard to all divine provisions YHWH Elohim himself supplied in the person of his Son. However, with those who until the end will show such a rigid attitude, obviously it will not turn out well. The next verse is precisely showing us that. "Hear! A sound of uproar out of the city! A sound out of the temple! It is the sound of YHWH repaying what is deserved to his enemies." Yes! how we long as we wait for Hashem to bring about the end to all the upheavels that Israel has endured. That He might deal kindly with His chosen people and bring to bear the righteous wrath of a holy God upon all who seek to destroy Israel. The day day will come when all nations will come to Jerusalem and they will come in peace. The Land will be restored and bear fruit and there will be much joy heard throughout Israel.